I built this website as a resource for people who want to get rid of a rat problem in a house. It's loaded with information, and if you have rats in the architecture, like in the attic or walls, your best bet is to just go to the home page, and read the information there. The principles for getting rats out of the attic are the same as for any part of the home. The only exception is if the rats are actually in the living area of the house - such as the living room, bathroom, kitchen, etc. If you actually have rats inside the living area of the house, that's a problem! It's even worse than if they are living in the attic or walls, because inside the house itself, with people, they can spread disease, chew on your food, contaminate your food or property, chew on wires, chew on anything, basically. It's extremely unlikely that they would attack anyone, such as a sleeping baby, because rats are cowards, and they want to be left alone. But when everyone is in bed, yes, they can come out and mess with your stuff. To solve a problem with rats in the house, you've got to find out how they got inside. In the below photo, we see some examples of areas that rats have used to gain access to the house from the outside. But what about how they are getting into the living space? Well, same thing - there are some openings that lead into the house. The power supply for the stove, which has a wire that goes into a wall and right up the wall into the attic is a good bet. I see lots of rats getting into the kitchen that way. Or maybe behind the washer/dryer? There could be several spots. Do a thorough hunt, and seal off any open areas with metal flashing, such as you see in the below photograph. If you've got rats coming through the toilet then make sure that there are no breaches in your plumbing pipes, and that the water traps are full. Read here about rats in the sewer. 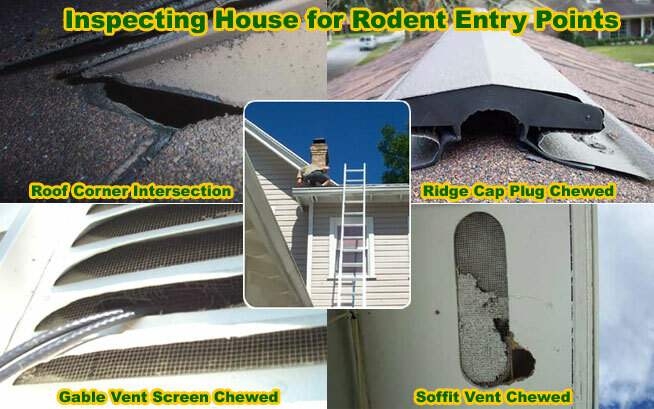 Killing rats in the house - Rats in the main are of a home are disturbing because they are in plain sight and are sharing your living space more intimately than a rat up in your attic. Rats are not particularly persnickety creatures and will live just about anywhere they feel is advantageous to finding food. If you have rats living in your home, make sure you eliminate access to anything that may be considered a food source for them. Exposed trash and unsealed food will only promote growth in the rat population no matter what your lethal trapping methods are. Not only do you need to eliminate the food source, you also need to eliminate access from the outside. Rats are ingenious when it comes to home invasion. They can enter in through pipes and drains; they do not necessarily need a hole in the foundation. Killing the rats once they are inside can be a challenge. Rats are smart and survive by being industrious. Trapping will mean knowing where to place the traps and what to avoid using. For rodents living in the main areas of the home—actually for rodents anywhere in the home—do not use poison. Any poisoned animals will crawl into a dark space somewhere in the home and die. This almost never happens in a convenient location. Bodies in the walls are even more difficult to remove than live rats! The best rat control comes from snap traps, not poison. Although I wrote this site with rats in mind, such as the Roof Rat and Norway Rat, the same principles apply to other rodents, such as the house mouse. Mice behave very similarly to rats, they're just smaller. Email me if you have any questions about how to get a mouse out of the house, mice in the house, and rodents inside homes.